With the big reveals of Essen just around the corner, October is always one of the most exciting months for gamers across the globe. This year, it’s even more exciting. That’s because we can proudly announce that Tabletop Gaming will be holding its very own gaming convention in London next year. Yes, really! Held in Alexandra Palace on September 29th and 30th 2018, Tabletop Gaming Live will be London’s new home for the latest and greatest board games, miniatures and RPGs. 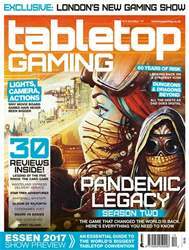 We’ve got a lot of exciting plans in the works and we hope you’ll be able to join us – turn to page 5 for the full details.If that wasn’t enough, from the end of November onwards Tabletop Gaming will become a monthly magazine, putting the finest coverage of analogue gaming in the world into your hands every 30-or-so days. The first monthly issue will be out on November 30th, and can now be found in more shops than ever before in the UK, including Tesco, Sainsbury’s, WHSmith, hobby stores and more! Visit tabletopgaming.co.uk to find your local stockist. Of course, you can also subscribe to make sure you keep up with the latest news, exclusive features and interviews, free gifts, and reviews of the games you shouldn’t miss. We wouldn’t be here without the support of readers like you, and we can’t wait to show you what else we have planned for the future. There’s no need to wait for all the excitement, though – enjoy our exclusive look in this issue at 2017’s hottest game, Pandemic Legacy: Season 2 and see what’s in store for this year’s Essen.